Are y’all enjoying this as much as I am? It’s like a treasure hunt: which of my local libraries will have the most Cybils nominated titles? I grew positively giddy when I learned that one of them had a tidy little stack of middle-grade novels that have been nominated. Since my post in which I linked up all most of the Cybils nominated titles I’ve read, I’ve read a nice number of picture books and longer works. 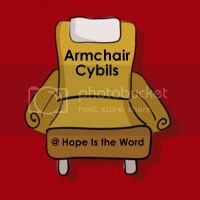 I thought it would be fun on these link-up posts for me to highlight a Cybils-related blog or two that I enjoy reading from time to time. Today it’s Jean Little Library. Jennifer, the author of this blog, is a youth services librarian in a public library, and she is also a round one Cybils panelist for the nonfiction picture book category. She is a frequent participant in Nonfiction Monday. I like that she makes her Cybils posts easily accessible on her blog with a nice little widget. I also like reading her “this week at the libary” posts which give an insider’s look at what it’s like to run the youth services department of a public library. If you’re looking for some good nonfiction picture books to share with your children (or to read for Armchair Cybils! ), check out Jean Little Library. Okay, that’s it from me. Happy reading! (I tried adding the category to my link submission, but it cut me off and wouldn’t give me any more typing space). Are you not revealing the links until the closing date? I see that I have a couple of weeks to post the reviews I didn’t get written by last night! GretchenJoanna–I fixed it so you can see the links now. And yes, this linky is open for a couple of weeks for that very reason. I’m so glad you’re joining in! Ack. Didn’t link my titles. Shame on me! I want to read Wonderstruck … I only recently read Hugo Cabret (sp?) and enjoyed it a lot more than I thought I would. Debating whether N1 is old enough to read it because I know she would LOVE the art. What a great idea to celebrate Cybils.